Eight players contested the National Forest AC Trophy over what turned out to be a fine interlude in the recent rainy weather in the Midlands. The rain returned just as the last game was finishing – one of a number of interesting endings, this one with penult & box v penult and box after time. The Egyptian format didn’t produce any upsets this year, and David Marsh from Wrest Park emerged as the clear winner having won all his games. Arthur Rowe was runner-up. Eight players, including three from Ashby, contested the National Forest AC Trophy over a drizzly weekend at Moira. The tournament was a B-Level event for the first time (AC handicap range 1 to 8). The event was run as an Egyptian and the games were not time limited, except in the final session to ensure a finish at tea time on Sunday. This produced a number of interesting endings with one or more balls pegged out. Adam Moliver, from Cheltenham, emerged as the clear winner. Adam lost only to home player Arthur Rowe who was runner-up. Ten players with handicaps ranging from 3 to 11 played in mostly glorious weather with the odd shower on Saturday. There were five Ashby players, one from each of Nottingham, Colchester and Hamptworth and two from Australia. The final set of matches paired Richard against Tim and Arthur against Bob with all four players having a chance of lifting the trophy. Richard used his bisques well to beat Tim in quick time, then had to watch anxiously as Arthur quickly went to peg with his first ball then broke down with his second. Bob slowly clawed things back but Arthur eventually prevailed and Richard became the first Ashby player to win this event. Jenny Biggs once again provided first class catering and the handful of spectators managed to stay awake for most of the proceedings. Tim earned a handicap reduction to 3½. Dave Gunn of Nottingham Croquet Club won our second annual National Forest AC handicap tournament at Moira, with Ashby’s Tim King finishing as runner-up. Entry levels were down on last year with nine players, two of them able to play on only one day. Nevertheless, it was a very enjoyable tournament and for most of the time the weather was good. The catering supplied by Jenny Biggs was superb and was enjoyed by all. Special mention must go to Vic Stilwell of Hamptworth club who travelled all the way from Dorset and to Judith Moore (Nottingham) who was competing in her first proper AC tournament and managed a narrow win in her final game. Dave Gunn and Tim King both won their Silver award (twice) and Dave’s handicap came down from 10 to 9. 1st Dave Gunn (handicap 10) 80% 2nd Tim King (4) 60% (beat Mick) 3rd Mick Haytack (6) 60% 4th Arthur Rowe (3.5) 50% 5th Vic Stillwell (11) 40% (beat Richard) 6th Richard Sanville (9) 40% 7th Judith Moore (20) 25% Derek Buxton (10) won his two games on Sunday and was the only player to beat Dave Gunn. Peter Dennis (5, Kenilworth) also played on Sunday. 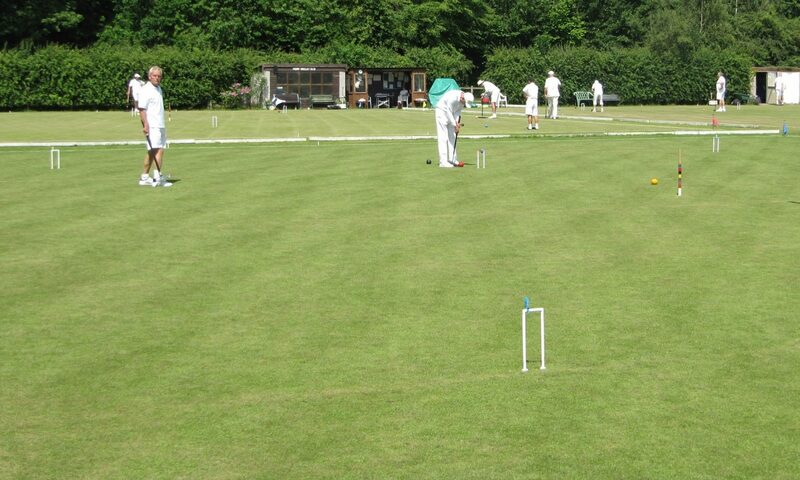 Ten players took part in our first-ever national CA tournament at Moira, won by Clive Goode of Nottingham Croquet Club. Derek Buxton of Ashby finished runner-up. The weather was reasonable on Saturday with a few light showers, and excellent on Sunday. Players: Rachel Rowe (3), Arthur Rowe (3.5), Peter Moore (5), Clive Goode (7), Mick Haytack (7), Barry Keen (9), Richard Sanville (9), Derek Buxton (10), Dave Gunn (10), Martin Wroughton (20). This was Martin’s first attempt at AC and he stepped in at the last minute when one of the original entrants had to withdraw. Barry finished a clear 5th.The semi-final between Rachel and Clive was quite tense and at one point all four balls were for peg. Derek took an early lead in the final but Clive hit in, took his second ball round and ended the weekend unbeaten. His handicap came down to 6 from 7. The National Forest AC trophy was presented to Clive by the CA chairman Barry Keen.